Everywhere on the beach of Boracay, so-called Island Hopping is offered to the tourists. But when you look at the map of Boracay, you might ask yourself, which islands they may use for "hopping"? In fact , there are only a few small islands around Boracay, which would come into consideration and they are, without exception, just a bit outside of the channel between Boracay and Caticlan on the main island of Panay. Most of them I would describe more as "rock" in the water ready than an island. Boracay Island Hopping means that they will take their guests not only to the two or three small islands but to most of Boracay's beautiful beaches, too. Some of them can only be discovered by boat. You either join a tour together with other tourists for the whole day, including BBQ on the beach for a lunch break and also including snorkel equipment for snorkeling at some of Boracay's coral reefs. 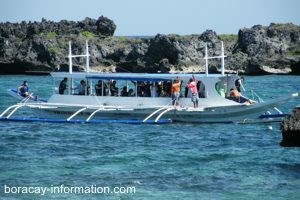 There are usually up to 20 people in one boat and the cost is 700 Peso per person. The other option is to rent a small boat (with a boat man of course) for a half day. 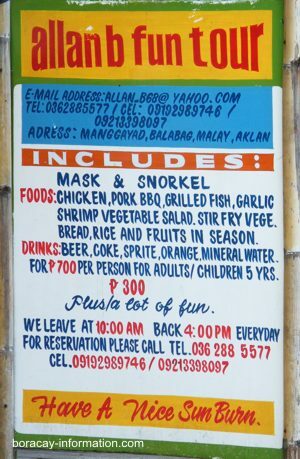 This does not include a BBQ or snorkel equipment but the cost is only 1.400 Peso per Boat. The small boat will cover more or less the same distance as the big boat and will stop by at most of Boracay's beaches and the small Laurel- and Crocodile Island. Depending on weather and wave conditions you will have to agree with the boat captain if you can go around the whole island or divide the trip in two half's'. In this case you would probably start at White Beach and follow the coastline up to Puka Beach and then turn around and try to see the small islands in the south east of Boracay. You will miss some of the beaches on Boracay's east coast. Please be aware of the commission hunters along White Beach who are trying to sell the same trips for a multiple of the mentioned prices here. Only book this trips with the proper operator, directly at the beach.